The 2014 Mitsubishi i-MiEV is the most affordable electric vehicle in America. It arrives here in the U.S. this spring. The 2014 Mitsubishi i-MiEV isn’t just about saving the planet, it’s also about saving buyers dollars. 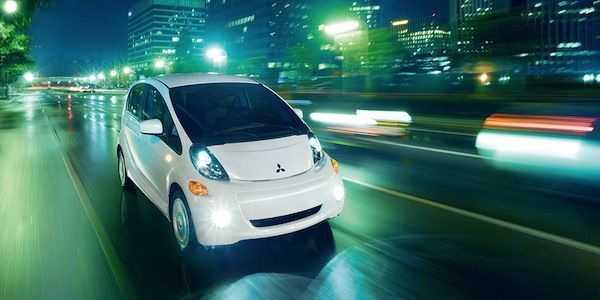 The 2014 Mitsubishi i-MiEV arrives this spring here in the U.S. and it’s the most affordable electric vehicle in America. The i-MiEV isn’t new, as more than 30,000 Mitsubishi i-MiEV and i-MiEV-based production vehicles have been sold around the globe in markets like the U.S., Europe and Asia. What’s the cost of the i-MiEV? One of the questions that most people will ask is, "How long will the battery last?" Mitsubishi says they have made considerable strides in battery technology over the years and as a result, Mitsubishi backs their lithium-ion main drive battery pack with a transferable 8-year/100,000-mile limited warranty. The 2014 Mitsubishi i-MiEV is powered by Mitsubishi’s Electric Vehicle (MiEV) technology. i-MiEV is rear-wheel drive and the drive system includes a 49 kW (66 bhp) AC synchronous electric motor; an 88 cell, 330V lithium-ion main drive battery pack for a peak storage of 16 kWh; and a single fixed reduction gear transmission. Mitsubishi says the electric motor is capable of producing peak torque of 145 lb.-ft. which should produce good acceleration from a standstill. The i-MiEV has a top speed of approximately 80 mph. Mitsubishi’s i-MiEV's comes with three drive settings to maximize driving efficiency and/or to increase energy recycling from the vehicle's regenerative braking system: "D"-position allows maximum performance from the vehicle as it generates 100% torque in direct response to accelerator input. The 2014 Mitsubishi i-MiEV can be recharged using three different methods. The EV can use a conventional 120 V Level 1 8A/12A portable charging cable that plugs into a standard wall outlet. The estimated charge time from near empty to fully charged is approximately 22 hours for 8 amp/14 hours for 12 amp). This can vary depending on battery temperature and its condition. i-MiEV can also be recharged using a 240V/15A Level 2 charging system (estimated charge time - 7 hours); and through a CHAdeMO Level 3 DC quick charging station (estimated charge time to 80% full is less than 30 minutes). What kind of fuel-efficiency does it get? Its EPA-rated fuel economy is 126 city/99 highway/112 combined MPGe (miles per gallon equivalent). Mitsubishi says the i-MiEV's "real world" EPA-rated driving range is 62 miles and 98 miles/charge in the EPA's LA4 driving cycle range. The 2014 Mitsubishi i-MiEV is compact in size, but its unique design makes it comfortable to carry four adults. This EV is designed with a tall roofline, rear-mounted electric motor and the lithium-ion-ion main battery pack is placed in a stainless steel safety cell underneath the floor of the passenger compartment. This allows rear passengers more legroom. Can the 2014 Mitsubishi i-MiEV compete with the Nissan LEAF, Kia Soul EV, Volkswagen E-Golf and Chevrolet Spark EV? If price matters, the i-MiEV is the most affordable electric vehicle in America. Looks like a winner to me... Good looking, affordable and cost effective as to stated battery life. However, the range is a bit inhibiting for some. Perfect intercity commuter, taskmaster. Sounds like a really sweet price. No mention of a battery cooling system. The i-Miev has always come with a battery cooling system I assume the new model is no different. It uses a forced air cooling/ system redirected from the air conditioning when needed to keep cool and an independant heat system to warm the batteries when the batteyr gets too cold. Another bonus they never mention is that Panasonic is a subisdurary of Mitsubitshi, meaning the batteries effectively come from the same company as the rest of the vehicle, that is something that not even Tesla yet does, though they are headed in that direction. If you can't afford a Telsa, the i-Miev is the next best thing in my opinion as despite the Hype and better advertising the Leaf has less cargo capacity and until recently no battery management system meaning the batteries were suffering loss of capacity of 3-4% per year in comparison to the average i-Miev losing less than 1% every 2 years. I bought an i-Miev and I love it, I would never go back to a non electric car. Change times are nonsense as you will never be chraging from empty. It woiuld be like saying I would have to fill an 80 gallon gas tank with 80 gallons of gas every day no matter how far I go. The calculations given are extremes and no one will ever need to go that far every day. I do about 100km a day, it works out to about 2-4 hours of charging twice on my peak days, depending on temperature, etc. This is often split up as I will charge at work and at home. The longest i have ever changed is 6 hours and on my non work days I often end up charging less than 15 minutes after running local errands. It may not work for everyone, but it works for most. 2018 Mitsubishi Eclipse Cross vs. Outlander Sport - How Are they Different?